The main image area on your home page will accommodate any sized image. It is advisable to limit the width to 800 pixels wide and the height of this image to less than 400 pixels. Images that are smaller than these dimensions will be centred in the middle of the page. 1. Click the HOME PAGE/FRONT PAGE link in the YOUR WEBSITE section of your back office. 2. On the YOU ARE EDITING: HOME PAGE/FRONT PAGE page, click the BROWSE button. 3. Select the jpeg or gif file from your hard drive (or another drive) which will place the name of the file in the text box. 4. If this is the correct file click the UPLOAD button. 6. 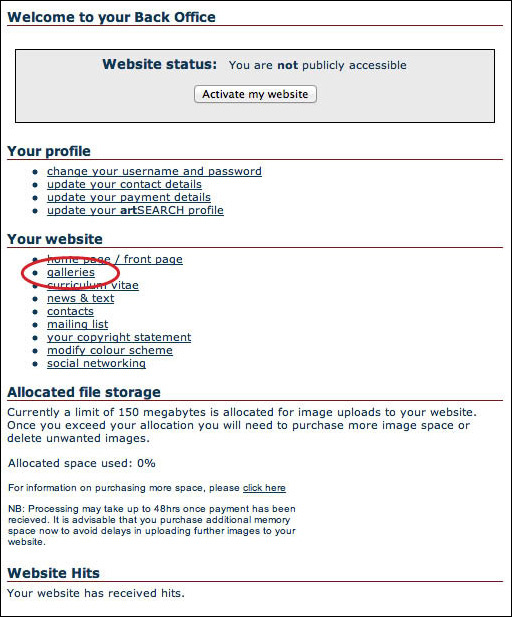 To delete this image click the delete button on the YOU ARE EDITING: HOME PAGE/FRONT PAGE page. NB. You must refresh your browser when viewing the change to your homepage image. On the header of each page of your website there is space allocated on the right hand side for a logo or photograph. The image uploaded to this box will appear at its actual size. It is advisable to limit the height of this image to less than 80 pixels and the width to less than 150 pixels. 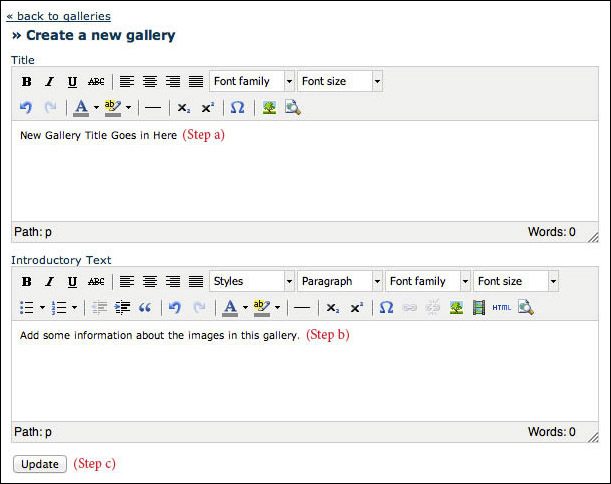 You can create as many galleries as you like and upload as many images as you like into each gallery. The GALLERIES have been designed so that you can create a gallery for each different body of work. For example you may create galeries for paintings, sculpture and drawings etc. ; or exhibition 1, exhibition 2, exhibition 3 etc. TIP 1: It is advisable to create more galleries with fewer images, as galleries with many images will take longer to download. For this reason it is recommended to limit galleries to less than 1MB which is the equivalent to 10 x 100 k images or 20 x 50 k images. When you first begin to setup your website you will see the words "Content Coming Soon..." on your GALLERIES index page. 1. Click the GALLERIES link in the YOUR WEBSITE section of your back office. 2. On the GALLERIES page click the EDIT THE INTRODUCTORY TEXT ON YOUR GALLERIES link. 3. Enter the required text and click the UPDATE button. 4. If you do not want any introductory text, follow the steps above, and delete any text at step 2. 5. You can format text and add images and video using the Rich Text Editor. STEP 1. Click the GALLERIES link in the YOUR WEBSITE section of your back office. STEP 2. On the GALLERIES page click the CREATE A NEW GALLERY link. STEP 3. On the CREATE A NEW GALLERY page, enter the title of the gallery and any INTRODUCTORY TEXT required, followed by the UPDATE button. STEP 4. You will now be able to start uploading images to your gallery. STEP 5. To create another new gallery, click the BACK OFFICE link in the header and then repeat the process. 2. On the GALLERIES page click the GALLERY you would like to add an image to. 3. On the EDIT THIS GALLERY page Click the ADD AN IMAGE TO THIS PAGE button. 4. On the ADD AN ART PIECE TO THIS GALLERY page, enter the title of the image (this can be changed at a latter stage), and click the BROWSE button. 5. Select the jpeg or gif file from your hard drive (or another drive) which will place the name of the file in the text box.